Though I had some plans for this afternoon, they ended up being cancelled. That left me with the dilemma of what to do with all my free time. I decided there are a few things in my house that need some organization. O.K., that is a humongous understatement. There are great quantities of organizational projects staring me in the face. I decided to pick the one that was bugging me the most. While this narrowed down my options, it still left me choosing between my bedroom closet and my spice cupboard. I know it sounds strange, but I can spin that stupid lazy Susan around five times looking for the desired spice. Since I don’t much like cooking anyway, the “spinning time” only added to my frustration. So, armed with some new “spice information,” I tackled the cupboard. First of all, let me share with you my “spice information.” The McCormick Company says that ANY spice of theirs that is in a tin (other than black pepper) OR was packaged in Baltimore, MD is at least 15 years old. The life expectancy of ground spices stored in a cool, dry place is 2 – 3 years and, for leafy herbs it’s only 1 – 3 years, depending on the herb. That information eliminated the alum and paprika from my cupboard right off the bat. I wasn’t so surprised to have unused alum because, seriously, what do you use that for? According to the package, which by the way, is still in pristine condition, it’s used for pickles and relishes. Alrighty then, that explains why I have an entire unused container. Perhaps it was a shower gift when I got married 33 years ago! Upon taking stock of my spices, I discovered that I had doubles of allspice, bay leaves, dill weed (I actually had three of these), garlic salt, nutmeg, ground mustard, pepper, poppy seeds, crushed red pepper, tarragon leaves, and peppermint extract (which technically isn’t a spice but still, I have two.) I had to throw away a few jars of spices packaged in Baltimore, MD, and then a few that I would clearly never, ever use. Once, I decided on what to keep, I alphabetized them all. 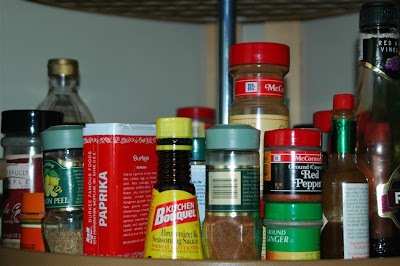 This may sound a bit over the top but I had my spices in alphabetical order about 20 years ago and I loved it. Then, my girlfriend, who loves to organize, came for a visit and talked me into putting them in “spice groupings,” such as “Italian spices,” ”pumpkin pie spices,” etc. It sounded like a good idea but I later discovered that this method only works for people who know what goes in each category. I haven’t a clue. When I make spaghetti, I use Ragu. It comes pre-spiced so my Italian spices sit idle. After the “spice group stage,” I’ve had 18 years of a completely disorganized stage. I know this exact time frame because it happened when we remodeled the kitchen. In my frenzy to get the kitchen items out of my dining room and back into the cupboard I just threw the spices in with a promise to someday alphabetize them again. And today, it finally came! It was WAY more fun to make dinner tonight. I mean, I still prefer to order out, but hey, I found every spice I needed in one spin or less. It’s still possible that there are spices in my cupboard that are more than say, five or ten years old. Wouldn’t you think they’d label them with an expiration date? It would surely up their sales. Maybe I’ll send McCormick a letter – someday. In the meantime, do you think I could get big money at the antic store for the tins of alum and paprika? After organization – finally in alphabetical order again. This entry was posted in My Everyday Life on August 21, 2008 by Nancy. Ok, anytime you have some free time you are welcome to come and organized my bedroom closet or spice rack! I need some serious motivation! You know…you COULD create a spreadsheet with the spice groupings each with its own tab and THEN alphabetized. 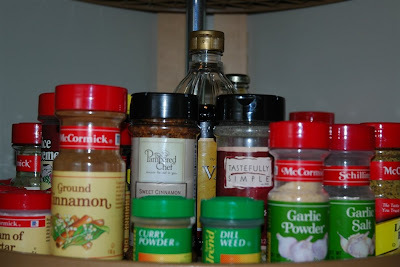 :) I’m just kidding…my spice cabinet is a mess!